Cambridge, Mass. 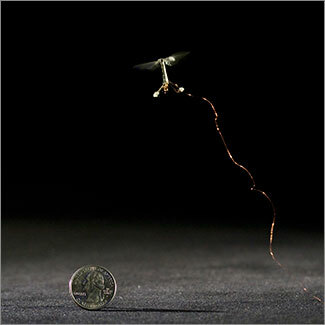 — In the very early hours of the morning, in a Harvard robotics laboratory last summer, an insect took flight. Half the size of a paperclip, weighing less than a tenth of a gram, it leapt a few inches, hovered for a moment on fragile, flapping wings, and then sped along a preset route through the air. Inspired by the biology of a fly, with submillimeter-scale anatomy and two wafer-thin wings that flap at 120 times per second, robotic insects, or RoboBees, achieve vertical takeoff, hovering, and steering. The tiny robots flap their wings using piezoelectric actuators — strips of ceramic that expand and contract when an electric field is applied. 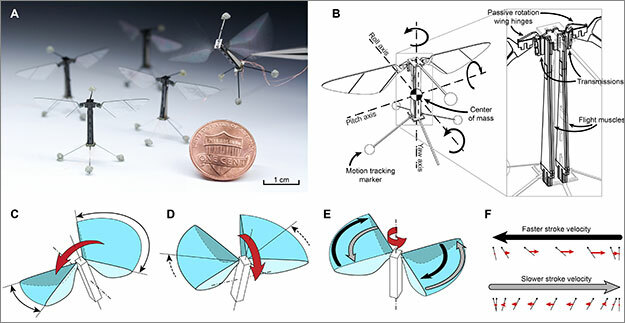 Thin hinges of plastic embedded within a carbon fiber body frame serve as joints, and a delicately balanced control system commands the rotational motions in the flapping-wing robot, with each wing controlled independently in real-time. Applications of RoboBees could include distributed environmental monitoring, search-and-rescue operations, and assistance with crop pollination. “I was so excited, I couldn’t sleep,” recalls Chirarattananon, co-lead author of a paper published this week in Science. Inspired by the biology of a fly, with submillimeter-scale anatomy and two wafer-thin wings that flap almost invisibly, 120 times per second, the tiny device not only represents the absolute cutting edge of micromanufacturing and control systems; it is an aspiration that has impelled innovation in these fields by dozens of researchers across Harvard for years. Flight muscles, for instance, don’t come prepackaged for robots the size of a fingertip. “Large robots can run on electromagnetic motors, but at this small scale you have to come up with an alternative, and there wasn’t one,” says co-lead author Kevin Y. Ma, a graduate student at SEAS. The tiny robot flaps its wings with piezoelectric actuators — strips of ceramic that expand and contract when an electric field is applied. Thin hinges of plastic embedded within the carbon fiber body frame serve as joints, and a delicately balanced control system commands the rotational motions in the flapping-wing robot, with each wing controlled independently in real-time. At tiny scales, small changes in airflow can have an outsized effect on flight dynamics, and the control system has to react that much faster to remain stable. The robotic insects also take advantage of an ingenious pop-up manufacturing technique that was developed by Wood’s team in 2011. Sheets of various laser-cut materials are layered and sandwiched together into a thin, flat plate that folds up like a child’s pop-up book into the complete electromechanical structure. The quick, step-by-step process replaces what used to be a painstaking manual art and allows Wood’s team to use more robust materials in new combinations, while improving the overall precision of each device. “We can now very rapidly build reliable prototypes, which allows us to be more aggressive in how we test them,” says Ma, adding that the team has gone through 20 prototypes in just the past six months. 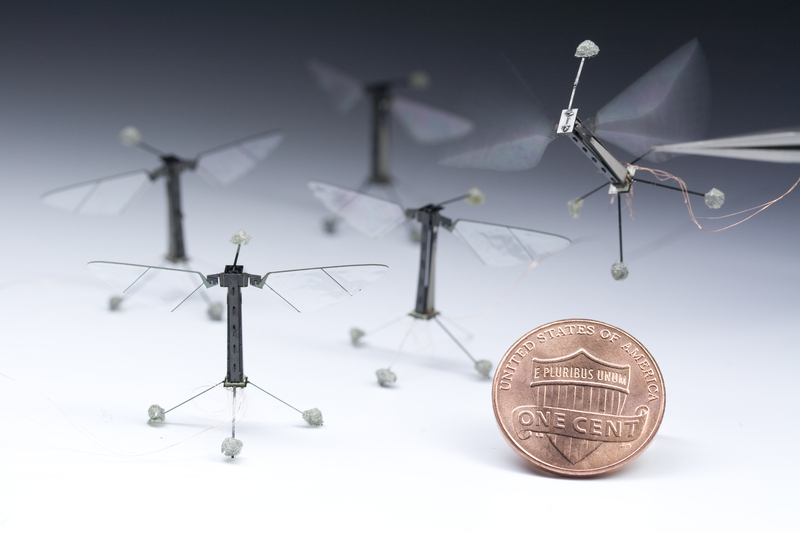 Applications of the RoboBee project could include distributed environmental monitoring, search-and-rescue operations, or assistance with crop pollination, but the materials, fabrication techniques, and components that emerge along the way might prove to be even more significant. For example, the pop-up manufacturing process could enable a new class of complex medical devices. Harvard’s Office of Technology Development, in collaboration with Harvard SEAS and the Wyss Institute, is already in the process of commercializing some of the underlying technologies. “Now that we’ve got this unique platform, there are dozens of tests that we’re starting to do, including more aggressive control maneuvers and landing,” says Wood. After that, the next steps will involve integrating the parallel work of many different research teams who are working on the brain, the colony coordination behavior, the power source, and so on, until the robotic insects are fully autonomous and wireless. The prototypes are still tethered by a very thin power cable because there are no off-the-shelf solutions for energy storage that are small enough to be mounted on the robot’s body. High energy-density fuel cells must be developed before the RoboBees will be able to fly with much independence. Control, too, is still wired in from a separate computer, though a team led by SEAS faculty Gu-Yeon Wei and David Brooks is working on a computationally efficient brain that can be mounted on the robot’s frame. The Wyss Institute for Biologically Inspired Engineering at Harvard University (http://wyss.harvard.edu) uses Nature’s design principles to develop bioinspired materials and devices that will transform medicine and create a more sustainable world. Working as an alliance among Harvard’s Schools of Medicine, Engineering, and Arts & Sciences, and in partnership with Beth Israel Deaconess Medical Center, Brigham and Women’s Hospital, Boston Children’s Hospital, Dana Farber Cancer Institute, Massachusetts General Hospital, the University of Massachusetts Medical School, Spaulding Rehabilitation Hospital, Boston University and Tufts University, the Institute crosses disciplinary and institutional barriers to engage in high-risk research that leads to transformative technological breakthroughs. By emulating Nature’s principles, Wyss researchers are developing innovative new engineering solutions for healthcare, energy, architecture, robotics, and manufacturing. These technologies are translated into commercial products and therapies through collaborations with clinical investigators, corporate alliances, and new start-ups. The Wyss Institute recently won the prestigious Webby Award, as well as the World Technology Network award for innovation in biotechnology. The Harvard School of Engineering and Applied Sciences (SEAS) serves as the connector and integrator of Harvard’s teaching and research efforts in engineering, applied sciences, and technology. Through collaboration with researchers from all parts of Harvard, other universities, and corporate and foundational partners, we bring discovery and innovation directly to bear on improving human life and society. For more information, visit: http://seas.harvard.edu.